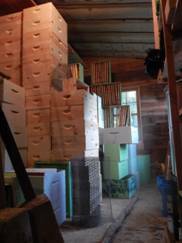 Do you have the storage space needed for beekeeping? Can you make the space needed for storage? It has been prudently said, before you buy something, decide where you will keep it. It is a common misconception among beginning beekeepers that keeping two hives simply means having two hives out back. In reality two colonies can very suddenly become four or five colonies. And five colonies can also quickly become one or two colonies. Here are some tips to help determine how much space might be needed. Don’t expect all your hives to be in the field. When creating storage space, make double the expected amount. A traditional basic hive with 3 supers for honey in addition to the brood chamber will measure approximately 18.5″ wide, 23″ long, and 42.5″ tall, or about 10.5 cu. ft.
Store hive components together (i.e. a place for lids, a place for bottom boards…) so that you can assemble what you need as needed. Wax Moth managenent: Provide as much light, ventilation, and freezing temperatures as possible. More on this in the lessons on pests. Boxes containing comb can be stacked on end so light can pass between frames. Avoid a dark, still, humid environment. Freezer Space – a deep box is 16-1/4″ wide x 20″ long x 9.5″ high. Often useful for wax moth prevention, storage of hive boxes full of honey ready to extract (called “supers”), bee feed storage, etc. Bee tight, easily mopped flooring, safe lighting, water and electric on hand, surface protection, access, etc. More on this in the harvesting section. Beeswax foundation should be kept above 55 degrees F (13 degrees C) to prevent it from shattering when being moved. It’s about avoiding difficult situations by looking ahead and being prepared.